Mining’s Santander zinc mine in west-central Peru. 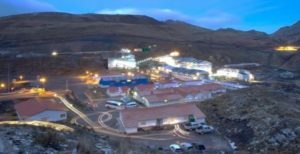 Source: Trevali Mining Corp.
Trevali Mining Corp. [TV-TSX; TREVF-OTCQX, 4T1-FSE; TV-LMA] on Wednesday September 26 said operations at its Santander Mine in Peru have been temporarily halted as a result of an illegal blockade. Trevali shares eased 5.92% or $0.045 to 71.5 cents on the news and trade in a 52-week range of $1.75 and 59 cents. The company said road access was temporarily blocked by a small group of community members and other persons not affiliated with the Santander Mine. This prevented the company from completing a scheduled delivery of supplies. Trevali said it has complied with all of its contractual obligations to the community and fully co-operated with government departments and other authorities regarding the blockade, which has now been lifted. Necessary supplies are now being delivered to the mine and full production is expected to resume within the week. The company said it expects that production and sales for the quarter will be negatively impacted. However, Trevali said it remains on track to achieve 2018 zinc production guidance at Santander. The company went on to say that the Santander senior management team is pro-actively engaging with the local community and is in continuing consultation with elected community leaders to discuss their concerns and ensure that mine operations continue without further interruptions. Trevali bought the Rosh Pinah and Perkoa mines, in addition to a basket of other assets, from Swiss metals trading giant Glencore Plc [GLEN-LSE]. The US$417.86 million acquisition was completed in August, 2017. “It is unfortunate that a small group of individuals chose to act in this manner instead of through open dialogue,” said Trevali President and CEO Mark Cruise. “We have enjoyed tremendous support from local communities at Santander over the years and will continue to work diligently with the community to strengthen our commitment to a mutually beneficial relationship,” he said. The Santander Mine is located approximately 215 km northeast of Lima, Peru. It is comprised of an underground mine, a 2,000-tonne-per-day processing mill, a conventional sulphide flotation mill, and associated infrastructure. This year, Santander is expected to produce up to 58 million pounds of zinc, up to 11.6 million pounds of lead, and up to 677,000 ounces of silver at a cost of between $38 and $42 per tonne. The company has been mining the Magistral, North, Magistral Central, and Magistral South deposits.